Many of us get to experience back pain early in life. Whether it’s because of some smaller injury or a wrong body position, we all sometimes get to see flashes of unbearable back pain. Women have even more problems than men, dealing with back pain almost every month. However, most of the time, one or two aspirins can ease the most common back pain troubles. It’s annoying and frustrating, but it’s not life-threatening. The problem arises when that troublesome pain turns into a more serious health condition. With modern 21st century style of living, we experience some of the most marvelous improvements in technology and lifestyle in human civilization, but that came with a price of a generally less healthy lifestyle than what most doctors and medical experts would recommend. We are sitting eight hours a day working, and afterward, we feel so exhausted that laying down or even more sitting next to a TV seems like the only way to relax, and it really seems that we’ve forgotten how it’s like to be physically active at all. The truth is that we don’t think much about our health condition before it’s too late. We remember to be more active when we start feeling that red alert in form of back pain. Then often becomes too late to exercise, as even many of the everyday psychical activities become an unbearably painful task. What can I do about this, you may ask? Well, every back pain is different, and therefore every treatment is different. While some people can find a cure in massages or electrotherapy, for some these treatments are less effective. A great relief can come in form of a back brace – a type of orthotic device that supports the spine that’s dealing with problems. A back brace makes movement possible and often relieves pain. It can also correct some spinal deformities. Doctors often prescribe them as a treatment for specific spinal problems. Our first best pick is Mueller Adjustable Back Brace. This back brace is specially designed to relieve the lower back pain. It is very flexible so it’s great for any physical activity. Many people find it very useful in dealing with sports injuries. It’s also great for various medical conditions and everyday use. That explains the enormous popularity of this product! The first great thing about this product is its available sizes. It has regular size fit (28’’-50’’) and plus size fit (50''-70''). 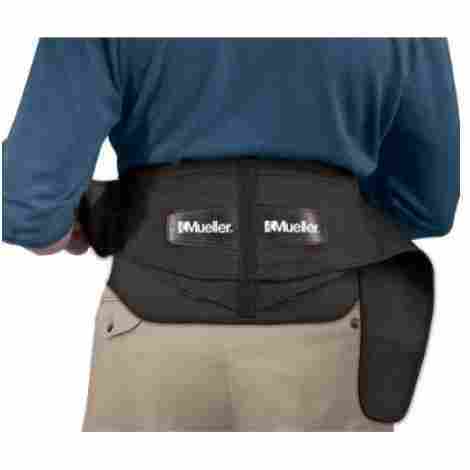 With its double layer design, Mueller Lumbar Brace easily becomes a custom fit, easily adaptable to various sizes. It’s very flexible so you can wear it most of the day without feeling any discomfort at all. For a more comfortable feeling, there is also a removable pad. The whole back belt is following the natural line of the spine, so you don't feel strange while wearing it. Additionally, it's easy to put it on and to take it off. The only complaint about this product is its size. The measurements aren't so accurate as it seems. You may find that your back brace is a bit wider or smaller than you would like it. 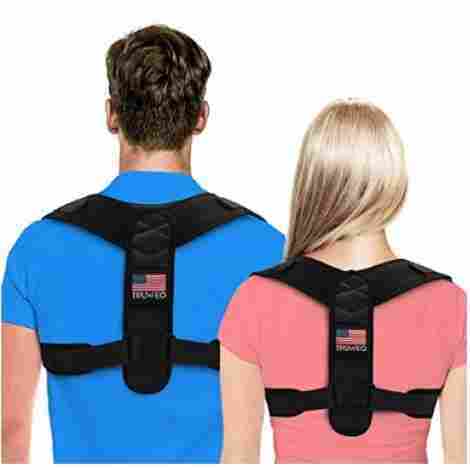 Mueller Lumbar Brace can provide spinal support for a range of medical conditions, including muscular weakness, arthritis, herniated disc, and many others. You can use it for posture correction and while doing sports, too. It has a steel frame that supports the stability of the spine. Therefore giving protection to your back and preventing additional injuries. Plastic material gives the brace rigidity and firmness that’s necessary for proper back support. The attractive price makes this product very popular among customers. Mueller Back Brace is suitable for various medical conditions, including providing support after spinal surgery. It’s firm but also flexible enough to allow you to move around easily. You can be both protected and working on the strength of your muscles. In the end, both value and price make this back brace one of the most popular on the market. The BraceUP makes great lumbar back support. It stabilizes the spine strong enough, but it’s not too sturdy to make you feel uncomfortable. It's great for athletes and sports in general. 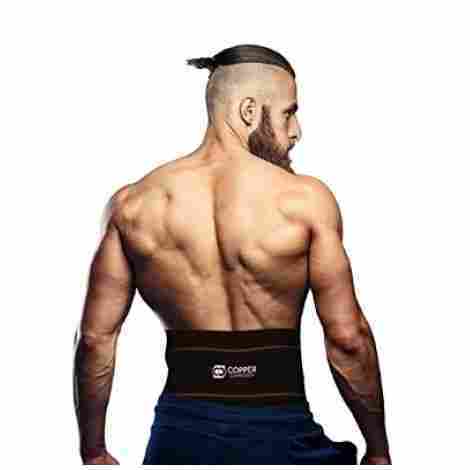 If you need something that will secure your back while exercising or doing any demanding physical activity, this may be the best product for you! With eight support strays, this back brace provides all the necessary support to your spine. You may ask yourself is it working while being this lightweight? Yes, and it’s doing a spectacular job! It corrects posture and prevents injuries as well. Some people may find that the level of support this product provides isn’t enough for them. It’s because this back brace allows you to move more, and it’s intended especially for that. If you need something that can give you sturdier support, you may want to try other product. BraceUP back brace is made from soft fabric which makes it great for sports. You can move, run, and exercise without worrying that your skin will be irritated. It also has a dual anti-slip design which holds the whole brace in its place. You can wear it for a long time without worrying that it could slip. It will stay close to your body, no matter what. It comes in three sizes (S/M- 28-35”, L/XL- 35-43”, and XXL- 43-53”), meaning you can surely find the one that fits you perfectly. It’s also very slim and hardly noticeable under clothes, allowing you to wear it to work or pretty much anywhere in general. BraceUP is a low-price – high-value product. It gives your spine full support, while also being easy on your wallet. The popularity of BraceUP shows that many people already recognized that it provides great value for money! The ComfyMed back brace is effectively dealing with pain from conditions such as sciatica, scoliosis, herniated sics, strains, sprains, nerve injuries, muscle spasms, and many others. It provides strong support to the spine without making it impossible to move. Wearing ComfyMed brace allows you to maintain your everyday routine without fear of anything going wrong! You have an option of the additional lumbar pad, which allows for extra support to the spine. Many back braces are made either sturdy or flexible, without adjustable options, and this allows you to adapt it to your own needs. The brace’s straps are also very flexible, making this back brace a perfect fit for any body shape. As it comes in two sizes, regular (26’’-37’’) and large (38’’-50’’), you probably won’t have issues with finding the perfect fit for yourself! ComfyMed brace is great for everyday activities. It provides support for the back without restricting your movement. The brace's quality materials make it gentle on the skin, and it’s perfectly safe to machine wash it – it’s very durable. While ComfyMed isn’t the best budget choice, it is affordable. It’s a bit more expensive in comparison to the first two picks on our list. However, it offers excellent features and it’s doubtlessly one of the best back braces on the market. The lumbar support brace by Sparthos is a good choice for people maintaining a sedentary lifestyle. It’s also comfortable while walking or lifting heavy loads at work or at the gym. While it can help you deal with various medical conditions, the brace by Sparthos is also good with everyday activities. This back brace is especially useful for people who deal with sciatica. Although it could be broader and cover the back a little more, it is excellent for pain in the lumbar area. Lumbar support belt by Sparhos also has a removable pad that provides additional support. If you need a stiffer brace that will restrain your movement a little, put the pad on. On the other hand, if you don’t wear a pad, you will be able to move around more freely. It's simple as that. What people found very useful is the discrete design of this back brace. You can wear it underneath your clothes and have long-lasting support in everyday activities. It's lightweight so you don’t experience the heavy feeling that most back braces give. 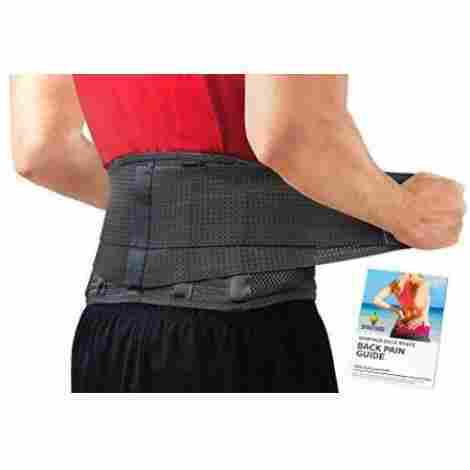 Lumbar Support Belt by Sparthos is a high-quality product with affordable price. It may seem a little expensive for some, especially if you compare it to the other products on the list. However, you should note that this product can be used for various conditions. For example, people with sciatica find it irreplaceable! The AidBrace belt helps with various medical conditions like sciatica, spinal disc herniation, scoliosis, and many others. It’s made to support the lumbar area during any physical activity. Not to mention that this brace also drastically relieves pain. It offers strong support to the back with 7 stabilizers for the firm and durable reinforcement. 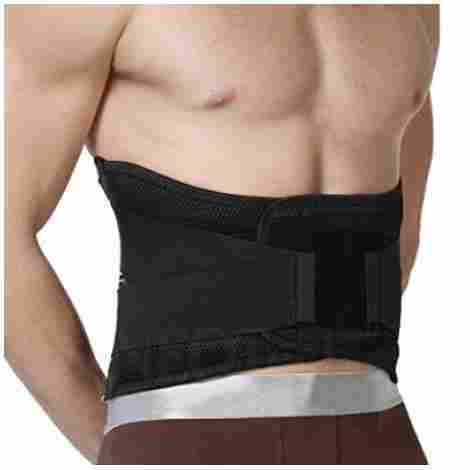 AidBrace also has a removable pad that allows for sturdier back support. AidBrace belt comes in three different sizes: 26-36’’, 37-47’’ and 48-58’’. It’s very adjustable and comfortable. It covers the back perfectly and holds it in position. You won’t feel any pocking or discomfort while wearing it. The only complaint from the customers is about Velcro belt. For some people, the straps of Velcro belt deteriorated very quickly! 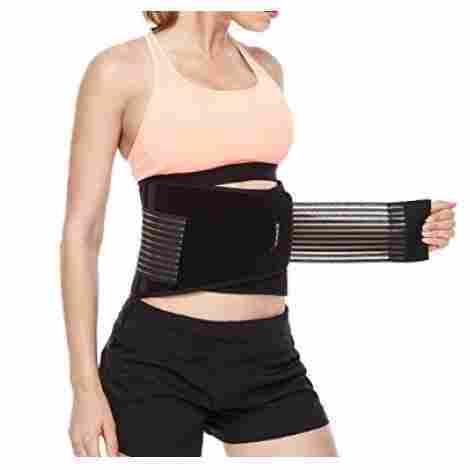 AidBrace belt stretches when you put it on, fitting perfectly to your body. Like previously mentioned braces, AidBrace has two straps to ensure a tighter position around your back. It’s made of cobweb material that allows circulating of air through the brace. Psychically active users find this quite useful. No more overheating or too much sweating with AidBrace! For the exceptional value that AidBrace provides to users, the price is very reasonable. You'll probably find it’s worth every penny! Even the people who didn't get what they exactly needed when buying this brace didn't have any complaints about the quality of the product itself. Old Bones Therapy Back Brace is a lumbar support belt. It does an excellent job of providing support to the lower back. A positive about this brace is that you get a little present of 2 Gel Packs. They can be used for both ice and heat therapy: the cold and the warm feeling lasts for hours, soothing the pain. If you didn't think that a back brace could do a whole back therapy, here is the proof! Old Bones Therapy back brace comes in three sizes: S/M (27-34 inches), L/XL (34-43 inches) and XXL (43-54 inches). Made from very elastic neoprene material, this back brace is a universal fit. It’s also very breathable so it stops unwanted sweating and warmth. The materials are also very durable and not toxic to your skin. You can wash the brace easily and hang it to dry. It’s very simple! With 4 stability strays, this back brace is not too sturdy. It offers support to your spine during any body movement. Its principal purpose is to prevent injuries and to improve body posture, but it also works with different medical conditions. With hot and cold therapy this back brace significantly reduces pain and makes everyday activities much more pleasant for people with chronic back problems. Old Bones Therapy made a high-quality back brace, but with one major flaw – it’s the price. Even though you get two gel packs with it, it remains one of the priciest back braces on our list. Neotech Back Brace is highly recommended by medical specialists. It’s a good choice for problems like sciatica, degenerative disc disease and slipped disc. This brace is a bit stronger than average, making it ideal for people with manual occupations or where heavy lifting is included. It also has a great effect on people who are sitting a lot on everyday basis. The breathable material makes the brace suitable for easing muscle spasms and pain in the lumbar area. Everyone who experienced pain from herniated disc knows how hard it is to relieve it. The pain just goes on, often through the legs, no matter the medications are taken. Neotech Back Brace soothes that pain in the lower back. It is also great for the correction of body posture and for physically active people. 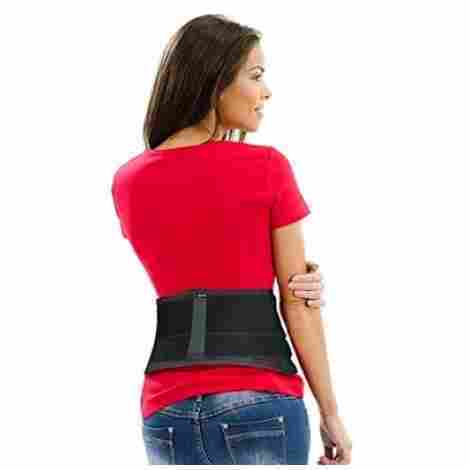 Neotech Care Back Brace has a primary inner layer formed by connecting the two strap ends. Additionally, the brace has an outer strap that goes in a criss-cross. Because of that, Neothech brace covers nearly the whole back. This kind of design also gives stronger support to the upper spine. Two layers definitely make a difference in the strength of the brace. On the other hand, stronger support for your back will not overwhelm you with too much warmth because of the breathable materials. It seems that Neotech took care of everything! 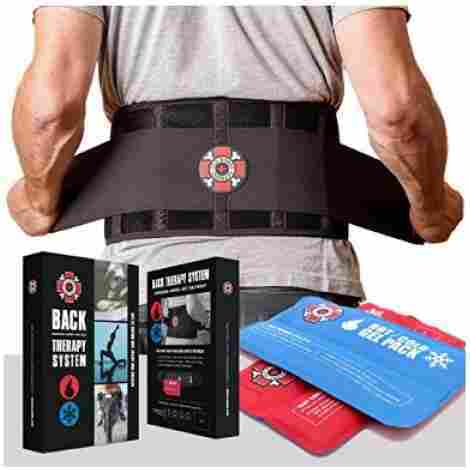 Neotech Back Brace is a good product with innovative design. It makes a big difference in the life of everybody who has back problems. Nevertheless, the price of this product isn't exactly a bargain. It's not sky-high expensive as well, so those who have some extra bucks to spend will find this back brace very useful! TRUWEO back brace is primarily designed to correct posture. It’s an upper back brace, adjustable from 28 to 44 inches. With only 30 minutes of everyday use, you will see an instant improvement with it. This brace provides support for clavicle posture. You can put it on whenever you’re working, lifting heavy loads, sitting in your job or in school. The most important thing is that TRUWEO helps with annoying and unbearable neck and upper back pain. How TRUWEO works? Well, this posture corrector helps your muscles to develop memory. That means that once you correct your posture, your back will stay straight even without the brace. The real question is: how long will Velcro straps last? We already had a product on our list with the same problem. The durability isn’t guaranteed. TRUWEO is simple to wear and barely noticeable under clothes. If you have to wear it to your work or school, you won’t feel embarrassed, as probably nobody will notice that you have posture corrector. Still, the more important thing is that you will feel comfortable while wearing it. It’s made of latex-free materials that are very breathable. This way you won’t feel overheated all the time. The complaints focus on the difficulty to put it on and take it off by yourself. Truth to be told, it's a big flaw, because you always have to ask somebody to help you. TRUWEO is an inexpensive back brace. You may just as well try it, and who knows, maybe you finally start sleeping well after a long time of pain induced insomnia? Here we have another posture corrector that does wonders for your shoulders and the upper back. It corrects posture with gentle pressure. Your muscles will remember to straighten up even after removing the Aroamas back brace. Even if you don’t need posture correction, you may find that Aroamas brace helps you with keeping the straight up stand in sitting positions. Back relief comes almost immediately. After a few weeks of using this brace, you will notice that the pain is gone and that your shoulders and neck are in the correct position. Although it’s not too firm to make your back hurt because of the compression, it’s heavy enough to straighten you up. Aroamas Posture Corrector is made of soft and lightweight material that goes easy on your skin. It’s not rigid at all, so you’ll be able to move around freely. The size of the brace is 28-47 inches, but it’s also very flexible. It's a good fit for men, women, and teens. However, some people find that the brace has some problems with staying in place. Aroamas Posture Corrector comes at a price to suit your pocket. Think of it as a product for everyday use. You can use it if you have problems with the upper back, but you can also apply it to prevent difficulties to happen. Sometimes we need to think about potential threats to our health before it’s too late! Copper Compression Brace is excellent for conditions like sciatica and tendonitis, but its principal purpose is to provide painless movement. This brace is slim and wide enough to cover your lower back without restricting your every move. You will still be able to do your everyday activities, but now without difficulties. Whether you are a professional athlete or you just get your high from physical activity, you will find Copper Compression a good brace choice. Copper Compression brace is an excellent option for psychically active people. It provides additional support to the lower back, so it’s great for gym freaks! Just note that this belt isn’t good for power-lifting - for other kinds of training, it will do wonders. Copper Compression gives the muscles necessary warmth, so they don’t contract (that happens in cold conditions). We know what you are thinking – you can't stand feeling hot, especially in the gym! Don’t worry about that though – the warmth is comfortable and relaxing. The name of the brace comes from copper-infused material from which it’s made of. Why do they use copper? It proves to be an excellent material that helps the brace to fit perfectly. Along with that, it seems that copper helps with circulation. It’s an excellent conductor of electricity, so it’s not a big mystery why that happens. Copper-infused material also provides the necessary flexibility, it’s soft to your skin, and not too hard on your back overall. That makes the brace comfortable to wear and still useful. Copper Compression back brace is a little pricey. You can find very similar items on the market with lower price. Of course, it's a valuable product, and if you need something especially for your training and physical activities, this may be the right choice for you - even if you have to spend some extra cash. With our contemporary lifestyles, almost everybody at least sometimes has a problem with tension in the back. We like to sit in front of a computer for hours, forgetting that our spine is suffering. You can find the best chair in the world, and you still won’t entirely fix the problem. That’s why we thought it’s important to give you a review of available back braces. Many people around the world find them surprisingly useful. As you may notice, we have some lower back braces and a few upper back belts on our list. We wanted to give you a review of all viable options. There are so many types of braces on the market and they are all suitable for different back conditions. Sometimes one brace can deal with multiple conditions, and sometimes not. However, people often have several problems or medical conditions that need to be fixed. That’s why the back braces with multiple functions are at the top of our list. It’s a matter of quality too – the back brace that can treat serious spine conditions and that can also be useful with every day back problems stands for quality. It’s vital that the things you wear don’t feel uncomfortable. Many back braces can be too stiff and therefore cut in your skin. We made sure that our selected products are flexible enough to be comfortable and yet strong enough to provide the necessary support to your spine. Almost every brace irritates the skin when worn long or during hard physical activities. However, new types of braces often have the mech that makes the back brace breathable, which we also took into account. Overall, we wanted to be sure that every back brace on the list is comfortable to wear. We also wanted to be sure that the braces on our list actually help people with their conditions. Therefore we tracked down many customers reviews that convinced us in the quality of the selected back braces. Nothing can be a better indicator of the value of a product like a first-hand review. Last, but not least, the cost was a significant feature that we had to keep in mind. Some people have an option to buy a more expensive product, while some obviously don’t. In either case, you should know the real ratio between price and value! Before making the final decision in the purchase of back brace, you may want to consider some additional factors. There are some high-quality products which provide all the great features, but you can make a bad choice even with them. That’s why you need to think seriously about picking the right back brace. It may seem like an easy task, but it’s the matter of your health, and that always has to have your attention! If you have some serious problems with your back, it’s always the best thing to go to specialists. You can ask them whether you need a back brace, or is it safe for you to wear one at all. Although many back braces are medically approved, they are all very different. It often happens that people are unhappy with their purchase because nothing is improving. Knowing the condition of your spine means knowing what kind of product you need. Everybody has different problems, remember that! You want to analyze what type of brace do you need. When you know your back situation, you know what is healthy for it. For example, many specialists recommend strengthening the muscle belt around your stomach and spine. On the other hand, when people suffer from an injury, or they go through an operation, no movement is really good. If you have to strengthen your muscles, a better option is a flexible back brace that allows full body movement. For resting and stronger support, the stiffer back brace will do. Think about your needs and look carefully what every back brace has to offer. First of all, note that back braces aren’t bad for your health. They are extremely helpful but like every other product, can be used wrong. Back braces give an excellent backing for your spine, but your muscles need to work too! Don’t wear it all the time, let your muscles be on their own sometimes. Secondly, don’t forget to keep your brace and your skin clean. Even with all that breathable back braces on the market, you can get some seriously annoying skin irritation. Wash your back brace often, and even more, if you are physically active. It’s also preferable to wear some clothes underneath it. There are many back braces that have flexible straps. They can extend a lot, providing better adjustment. Some manufacturers make the back braces that fit every body type. Nevertheless, it is crucial that you take the right measurements of your back. That way, you won’t have to worry about returning the product. Also, the back brace will only work if it fits you perfectly! Q: How does a back brace work? A: A back brace is offering support to your spine muscles and bones. The type of back brace varies from a flexible one to very rigid. All of them are preventing you from stretching your muscles in ways that you can decrease or completely regress your treatment. Less movement means no chances to get hurt and more possibility for rest and healing. On the other hand, there are back braces that allow more movement for those who need to be active to strengthen the muscles around the spine. Q: Should I wear my back brace while sleeping? A: You should follow your doctor’s instructions on how long you should wear a back brace during the day. Some people have to wear it for almost the whole day, while others need to put it on when they are performing some harder physical actions. It depends on your back problems. However, sleeping with a back brace is not a good idea. Back pain is making sleeping unbearable, and the need to relieve that pain is understandable. Nevertheless, the back brace is designed to support your muscles, not to replace them. Wearing it during the night can cause some unwanted problems. Tip: Ask your doctor before you make any change with your back brace. Q: Can back brace cause any problems? A: You can have some problems if you use a back brace all the time. It is made to support your muscles, but not to replace them. Relaying too much on a back brace can weaken your muscles. It can’t do all by itself, and you also have to respect your prescribed treatment. Follow the exercises that your doctor showed you. Also, don’t increase the wearing time of the brace by yourself, and you should be just fine. The fact is that back brace can do much good to your back, but to do so, you need to use it right. Q: Should I wear a back brace while working? A: If your work demands sitting for a long time or lifting heavy objects, a back brace can help a lot. When you lift heavy loads, your spine is under additional pressure. A back brace can assist in stabilizing it. Also, in a sitting position, we tend to lean forward because it seems more relaxed. That makes additional stress to our spine, causing tension and pain. A back brace can help us maintain a proper posture for a long time. It also relieves stress. Q: How to wear a back brace? A: When you are buying a back brace, you want to make sure to get the right size. If you want it to work correctly, it has to fit you perfectly. First thing first: get the right size. The back brace shouldn’t be too tight nor too loose. Measure your back and then search for a suitable size. When you get your back brace, wrap it around your back and connect its two wings. You can pull the ends left or right for additional adjustments. Try to relax while wearing a brace. For example, if you contract your stomach muscles, a back brace may not work well. Wear comfortable clothing. People often wear their back braces over clothes because it can save them from skin irritation. On the other hand, if you want to cover it with clothes, make sure that you clean your skin before and after usage. If some irritation or inflammation occurs, contact your doctor as soon as possible.